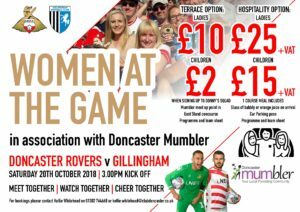 I’m delighted to be working with Doncaster Rovers on their Women at the Game campaign which is launching at the club on Saturday October 20th. Aimed at women of all ages, all backgrounds, ethnicity, ability and religious belief, “Women at the Game can empower women to experience the fun of going to the game, match or tournament without fear of intimidation, feeling isolated or in need of companionship. Making friends is a basic instinct the world over”. Groups of friends going to the game in a non-tribal way could be the beginning of a new adventure for many women. If you’re like me, going to a football match, especially with kids in tow can throw up all kinds of questions in terms of logistics... How do we get there? Can we park nearby? Which entrance should we use? To make it easier for women to go along to see Doncaster Rovers in action, Doncaster Mumbler will have a Mumbler Meeting point at the stadium, in the Family Stand before the match. We’ll have some fun activities in the family enclosure when you arrive …Donny Dog’s kennel will be open, there will be FREE face painting, crafts, colouring and the opportunity to meet and have a photo with Donny Dog. If you prefer to meet up with other parents in the town centre before the football match, head to Flip Out in the Frenchgate Centre, have coffee, let the kids have lunch and a play and travel by bus to the Keepmoat Stadium together! For those driving straight to the Keepmoat, parking is available in Car Park 2. On arrival, access to the Family Enclosure is in the East Stand Concourse, around the back of the stadium (overlooking the Lakeside). If you’re approaching from the car park, you’ll likely see a crowd of people starting to congregate near the front of the stadium/Alick’s Bar – avoid the crowd. Go behind the stadium. Hospitality Option – £25 + VAT Ladies, £15 + VAT Children. This includes a 1 course meal, a glass of bubbly or orange juice on arrival, a car parking pass, programme and team sheet. Toilets are easily accessible on the ground floor and are huge.